Name for a special type of wine produced from frozen grapes. It already has to be in the antiquity have given an "ice wine", because the Roman poet Martial (40-102) reports of winegrowers who brought in frosty grapes in November. Also in the 1st century described the scholar Pliny the Elder (23-79) on certain grape varieties: "They will not be read until it has frozen" . This indicates the deliberate and not accidental production of ice wine. Later, however, this type of harvesting and vinification seemed to have been forgotten. Allegedly, the extraction of ice wine was rediscovered in France towards the end of the 18th century. Similar to the Trockenbeerenauslese Initially, the phenomenon was not deliberately planned, but most likely coincidentally, when a very early frost break surprised the wineries during the actual main harvest. 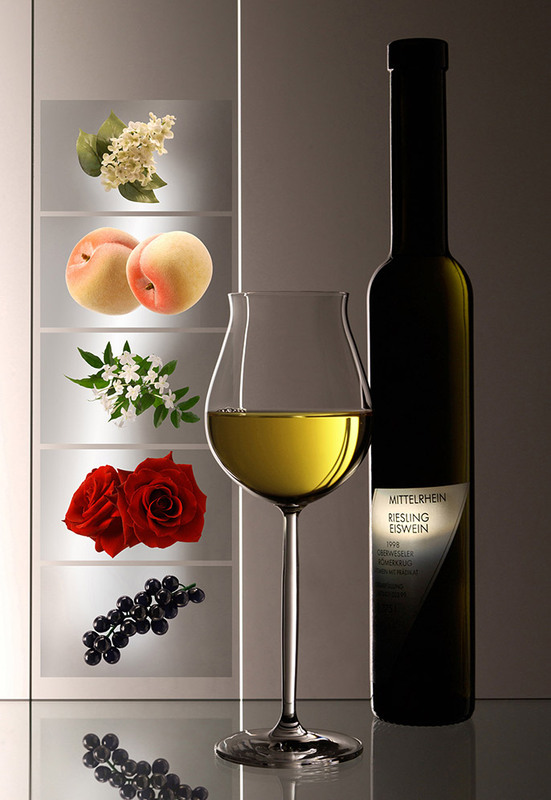 First ice wine harvests in Germany allegedly took place in 1794 in Franconia. 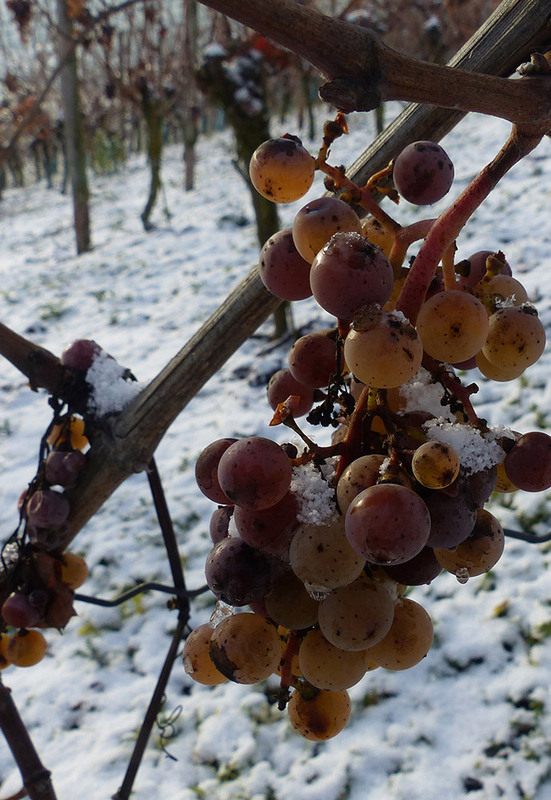 The first documented ice wine was on February 11, 1830 by grapes of the vintage in 1829 in Dromersheim at Bingen in the growing area Rheinhessen read. There was an extremely cold winter and some winemakers came up with the idea of ​​hanging the grapes to feed the animals. When it was discovered that the grapes contained very sweet must, they were pressed. In this regard, even an ice wine monument was built in Dromersheim. For the 19th century, however, only six years in Germany have documented in writing, in which Eiswein could be obtained. This was the mentioned vintage 1829, as well as the years 1846, 1858 (on the Castle Johannisberg ), 1875, 1880 and 1890. Today one understands one among them Sweet specialty the northern one wine producing countries because only in these latitudes the necessary climatic conditions prevail. However, this applies only to those areas where relatively early and strong frost breaks occur. In Germany and Austria Although not every year, but always such conditions are given. In both countries is the Eiswein a special type of wine within the quality wine category Prädikatswein, An excellent Icewine culture developed from the mid-1970s in Canada (Ontario), which was founded by the native Austrian Dr. Karl Emperor (1941-2017) at the winery Inniskillin was initiated. The production is extremely complex and risky and unpredictable. In addition, the harvest is only a fraction of a conventional wine, which explains the relatively high prices. The Mostgewicht must at least one in Germany and Austria Beerenauslese correspond. Ice wine can only be made from fully ripe grapes; If the grapes freeze in an unripe state, all of the grape juice is frozen and no higher sugar concentrate can be squeezed off. Unconditional requirement for the vintage is frost, The most healthy and usually not of Botrytis affected grapes must be left until the frost on the vine. This is usually the case at the earliest from the month of November, but can only apply at the end of January next year. The outside temperature must drop and last at least five hours, or at best longer to at least minus 7 degrees Celsius or colder. The sweet must with the extractives has a lower freezing point than water. The extractives in the berries prevent freezing of the water at 0 ° Celsius. The lower the temperature, the better the water molecules freeze and thereby the pure musk extract can be squeezed out. The ideal time for the harvest is usually the early morning. The grapes must then as soon as possible and completely, that means without stemming be pressed. The frozen grapes are used to separate the concentrated grape juice with all extract and sugar-rich ingredients from the ice crystals. Only this must concentrate expires, the ice (water) remains and is eliminated with the pomace. This will be checked by an official inspection body on the spot. The process is very slow and takes several hours, during which time the press cake may not or only slightly thawing, both for legal and qualitative reasons (decrease in must weight). There are attempts by freezing concentration produce similar products. In 2001, the European Union has the protected name Icewine approved for the European market and thus opened the Canadian market to the ice wines from Germany, Austria and other EU countries. This page was last modified at 23 February 2018 at 08:43.